Kandivali a suburb of northern Mumbai, India has metamorphosed as the new residential hub with world-class construction, lavish homes and multifaceted amenities that provide an enviable lifestyle. Initially known as Khandolee, this place gained importance as a source for quarrying rocksfor reclaiming the Bombay Backbay in early 1900. During the real estate boom of 1980s to 1990s, a vast population of Mumbai shifted here making this a very sought after suburb.Over the years the popular destinations that developed here are Thakur Complex, Thakur Village, Lokhandwala Township, Samata Nagar, Damu Nagar, Charkop, and Poisar . Great connectivity here is a boon with one of the oldest Kandivali railway station and Poisar Bus Depot, known as BEST bus depot. Western Express Highway, on the east of Kandivali,provides easy connectivity to the other areas of Mumbai while the Borivali Flyovers, the Link Roads ofMalad-Andheri,Mulund-Goregaon,and the S V Road along with the Link Road on the west provide connectivity to the prime routes from here. Also proposed are two Mumbai Metro lines. Important commercial destinations of Mumbai likeAndheri, the Bandra-Kurla Complex and Goregaon are close toKandivali East and are well-connected.Presence on an envious social infrastructure because of the urban chic upper and middle income groups which dictate the residential development of Kandivali. Kandivali has top notch social amenitiesfor the nuclear families with dual incomes, such as educational institutes, hospitals, and leisure facilities.Some important landmarks include Lady of Remedy Church, Lady of Remedy High School, St. Lawrence High School, Cambridge School, Ryan International School,Shatabdi Hospital, Gokul Hospital,Growelmall, V mall and residential complexes. Kandivali is an Industrial hub with the Mahindra & Mahindra plant,Times of India printing press,and numerous Industrial complexes like Akurli Industrial Estate, Kandivali(Charkop) Industrial estate, and Gundecha Industrial Estate, all based here. With many reputed developers building splendid projects here, Kandivali’s skyline is now adorned with magnificent high-rises and housing projects. 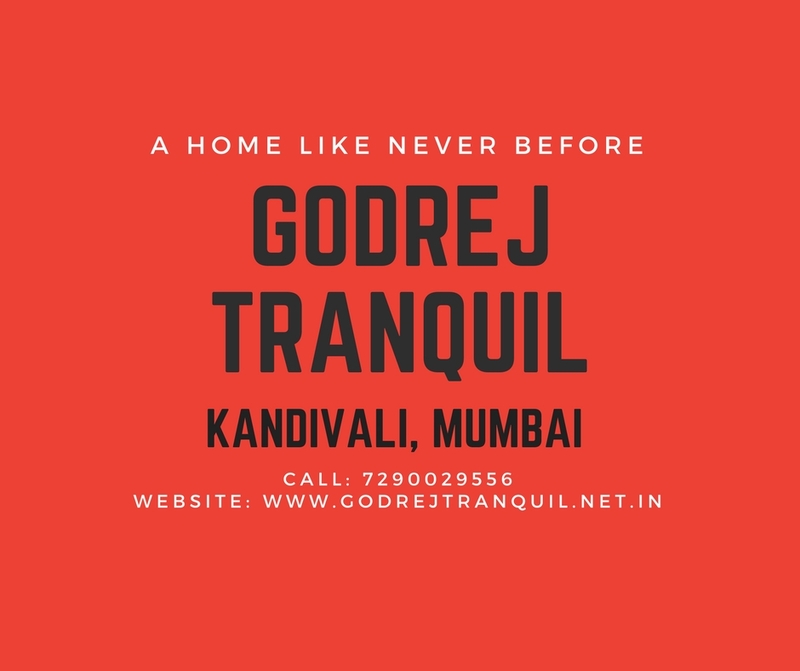 Godrej Tranquil at Kandivali is one such grand project coming up here.Over the last few years the exponential development here has seen a sharp rise in real estate prices. The Godrej Tranquil price also continues to rise at a fast pace along with the development here.